Have you ever had those moments in your life when something totally unexpected happened, and it left you feeling completely bewildered? The odds of it’s occurrence could have been very low or even next to impossible. Some of the possible manifestations of coincidences that people have encountered in their lives include: meeting significant people at the right place and at the right time, stumbling across the lucrative career opportunities when you least expect it, finding the perfect solution to a pressing problem that you’re facing, or repeatedly seeing signs, omens and synchronicities that lead you towards your vision. The formal definition of coincidence is “a remarkable concurrence of events or circumstances that have no apparent causal connection with each other”. 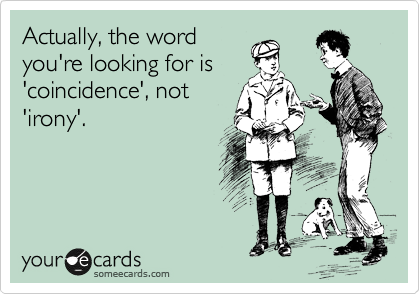 The word “coincidence” has its roots in the French word “coincider” and Medieval Latin word for “coincidre”. It was first used in 1680s by Sir Thomas Browne who identified synchronicities as a concurrence of events with no apparent connection. The key nature of coincidences is that it lacks an apparent causal connection to the person experiencing it. It seems to happen ‘out of the blue’ and cannot be explained by rational thought or logic, at least initially. Since there is ambiguity and uncertainty involved in causality, we have the liberty to interpret coincidences in a way that makes sense to us. In other words, coincidence is in the eye of the beholder. Most of us are quite happy to do this. Humans are born meaning-makers with a penchant for seeking patterns in everything around them. It’s an unconscious coping mechanism that we use to make sense of the world and sort through the overwhelming data thrown at us every day. We notice and analyze patterns everywhere in an effort to understand our environment and, to a small degree, control it. I’ve struggled with interpreting coincidences most of my life because of the conflict between the spiritual and scientific faculties of my mind. I soon realized that the explanation I chose to subscribe to ultimately came down to whether or not I believed in the existence of a Higher Power that directs my life journey. And I think that’s the question we should all ask ourselves when interpreting coincidences. But wherever you fall in the belief continuum says more about you than it does about the actual truth. The good news is that no matter which side you choose, there are theories, doctrines and research to back up each side. Both camps have passionate supporters who have worked hard to validate their beliefs. For instance, Swiss psychiatrist Carl Jung’s theory of unus mundus, or one world, states that there is an underlying order and structure to reality that connects everything and everyone. He believed that coincidences are meaningful events that cannot be explained by cause and effect, were caused by a force outside of causality known as ‘synchronicity’, or an “acausal connecting principle”. Religious scriptures claim that coincidences are signs from God that signify His power over life’s events, and if you experience a coincidence, you’re the lucky recipient of divine grace and guidance from the heavens. There’s a prevailing sense that certain things are meant to be and that they’re happening for a reason, even if it’s unknown to us. There’s a calm acceptance of the unknown and the mysteries of life. A popular spiritual concept known as ‘divine timing‘ states that events occur in an exact manner based on a predetermined plan for our life. Synchronicities are merely reminders that the larger plan for our life is unfolding. This thought process can veer towards the supernatural, occults and the paranormal. Research shows that people who pay attention to coincidences are more likely to believe in the occult. According to statisticians, coincidental events are not random or meaningfully related and they happen all the time. In his book, The Improbability Principle, David Hand says that extremely improbable events are commonplace. When we switch our lens to look at coincidences from a purely statistical point of view, we’ll see that they are, in fact, inevitable and less remarkable than they appear to be. Hand believes that humans generally aren’t great at using their objectivity when reasoning about probability in their everyday lives. Our drive to make meaning and spot patterns can lead us to make irrational associations and connections. A need to feel significant and to believe that their life has purpose leads people to fabricate fairly egocentric explanations about coincidences that comfort them. Research has shown that there are certain personality types that tend to experience coincidences more often than others. This group includes people who see themselves as being religious or spiritual, high meaning-seeking, and who tend to relate information from the outside world to themselves. It’s also been shown that people are more likely to see coincidences when they are angry, anxious and sad. I personally believe that it’s unfair to label people who derive meaning from coincidences as irrational or delusional. To see ourselves as victims living in a random universe, whose fate relies on inexplicable forces that are out of our control, is disempowering and doesn’t honor our intelligence and potential. Cynicism and skepticism will only create barriers around us and leave us feeling weak. I think that coincidences are real and denying their existence stops inquiry and prevents us from expressing our power as a creative force. Regardless of what you choose to believe in, try to develop a perspective that makes your life an adventure of discovery so that you can explore your capabilities. Allow the magic of synchronicities activate a sense of awe. 1. 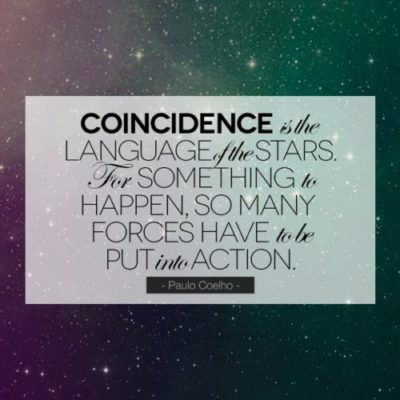 Define what a coincidence means to you: There are different ways to interpret coincidental occurrences. You can see it as a ‘wink from God’ or a purely random chance occurrence, or simply a reminder that there is a greater higher force that orchestrates our connectedness. 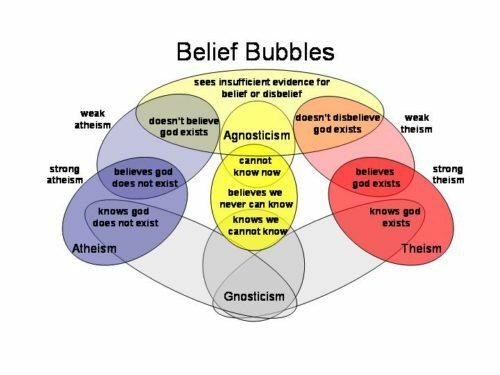 You can figure out your position by reflecting on where you see yourself in the belief continuum – are you more religiously and/or spiritually inclined? Or is your reality based on facts and science? The bottom line is that there is no right or wrong way of perceiving coincidences. No one can really prove mysterious happenings, so whatever you choose to believe is largely based on how you choose to see things and not on a gospel truth. In other words, you define your reality based on your personal values and where you see yourself within the grand scheme of things. 2. Examine past coincidences in your life: Taking time out to reflect on all the coincidences that have occurred in your life thus far will enable you to gain perspective on this phenomenon and how it has impacted your life. List down all the major coincidences and synchronicities that stand out in your memories. Focus on the ones that left you feeling awestruck and filled you a sense of wonder and write down your responses to these journal prompts: Describe the circumstances in detail and how they made you feel. What was significant about that particular coincidence and how was it relevant to whatever you were going through at that particular stage in your life? What did you learn from this experience and how did it influence your decisions and your relationship with a Higher Power or the Universe? 3. Adopt a curious perspective: No matter how you choose to explain coincidences, there’s no denying that when it does occur in your life, it can absolutely take your breath away. It would be a pity to deny ourselves of this cosmic treat by dismissing synchronicities as pure chance and ignoring them. I’ve found that seeing the Universe as a cold, random and impersonal place is not conducive to a joyful state. At the same time, I know that some of us, myself included, don’t want to romanticize coincidences and over-analyze them to the point that we let it control our destiny. I believe that the middle ground is best, which involves viewing coincidences from a place of curiosity. We avoid labeling them or trying to put them in order in our mental files, and we get comfortable with ‘not knowing’. We fight our compulsion to understand these seemingly chaotic and enigmatic events and we choose, instead, to be enthralled by the mystery and magnificence of events that occur in our incredible Universe. Coincidences provide evidence of our significance in the cosmic ocean. Like sailors, we need to tap into the wisdom to adjust our sails and the course of our ship, based on the ebb and flow of the tides of this ocean. 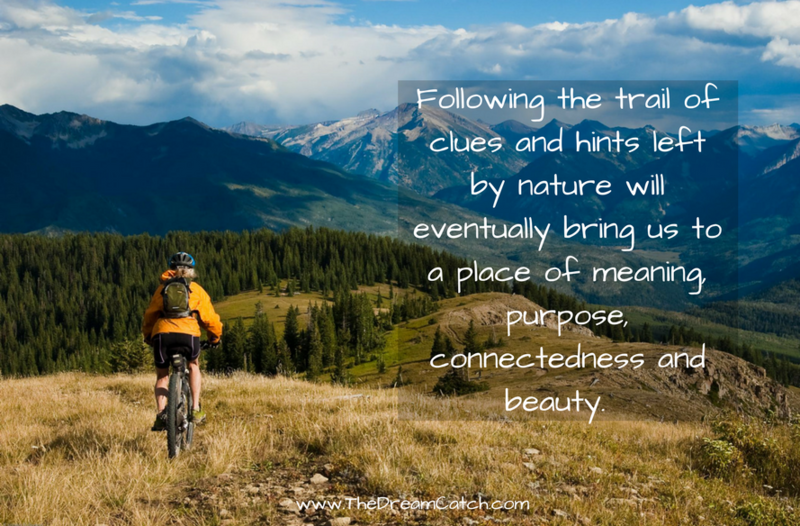 Following the trail of clues left by coincidental events will eventually bring us to a place of meaning and purpose. Question for you: What are your beliefs around interpreting coincidences and synchronicities?